Indesit has introduced a new built-in washing machine and washer dryer that feature its Push&Go one-button system. Push&Go is a single push, one-button system that begins a dedicated cycle, without having to adjust any of the settings or pressing start. This easy-to-use feature is a perfect ‘one touch’ solution for consumers with limited time. The new Push&Go built-in washing machine boasts an efficient ‘A++’ energy rating alongside Indesit’s water balanced technology. The company’s new built-in washer dryer has a wash to dry capacity of 7 kg washing/5 kg drying load. It has 14 programmes to choose from, including dedicated cycles for sports kit, duvets and woollen items. 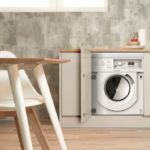 Sara Bazeley, Brand Manager, Indesit said: “Laundry appliances are an essential product in the home, but completing the chore of laundry isn’t something the consumer tends to look forward to. At Indesit, we understand that life can be hectic, that’s why our appliances are designed to simplify daily life, with practical solutions created to help save the consumer time, money and effort.